Scorpions have a bad rep. Their very presence can instill terror. But this fear is often misplaced. Although all scorpions have venom, off the 1,050 species in existence, approximately 25 have the potential to be fatal and only a handful have venom potent enough to kill a healthy adult. The rest deliver stings not unlike those of a wasp. America’s only deadly scorpion has a misleading name, as its habit extends far beyond Arizona, into Utah and California. The Arizona bark scorpion is small and easy to miss. A full-grown adult will measure only 2 1/2 inches in length and his sandy color means he camouflages incredibly well against the sandy ground of his habitat. The venom of his sting is designed to quickly paralyze his prey so that it can’t scuttle away and die out of reach. Due to the potency of the venom, Arizona bark scorpions pose a risk to humans. The death stalker might not be the deadliest, but it has the most fear-inducing name. Although not typically capable of killing a healthy adult with a single sting, the death stalker scorpion can cause incredible pain. These distinctive, bright-yellow scorpions max out at 4 inches in length and inhabit the deserts of northern Africa. The Tunisian fat tailed scorpion is ranked by Guinness World Records as the world’s deadliest and is quite capable of killing a healthy adult with his sting. This scorpion, native to north Africa, is responsible for 80 percent of stings and 90 percent of scorpion-related deaths in Africa. The Indian red scorpion inhabits India, Pakistan and Nepal and is common throughout all. It reaches approximately 3 inches in length when fully grown and possesses a large pair of pincers, capable of inflicting a painful nip when it doesn’t feel like using its stinger. 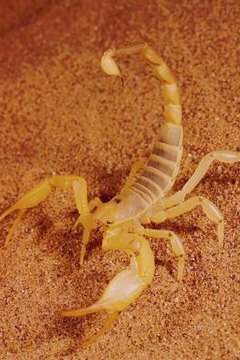 The Brazilian yellow scorpion has been known to cause deaths in children but poses less of a threat to healthy adults. The sting of the Brazilian yellow causes pancreatitis in human victims. For this reason, the scientific community is extremely interested in examining the scorpion’s venom to look for treatments for the same disease. Slate: How Deadly Are Scorpions?